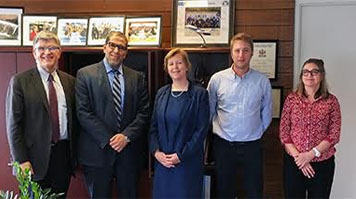 Academic leaders from LSBU’s School of Arts and Creative Industries and Ryerson’s Faculty of Communication and Design (FCAD), based in Toronto, announced the research and innovation partnership to increase funding and collaboration for international scholarly and creative research output at both institutions. The pilot is designed to stimulate research-based discovery across cultures, industries and markets, and is expected to unlock new funding from government and non-government sources for both institutions. The pilot will be run by student business incubators at both organisations, including Ryerson’s renowned DMZ, Transmedia Zone, Design Fabrication Zone and Fashion Zone and LSBU’s award winning Clarence Centre for Enterprise and Innovation. Both institutions will present an overview of their research interests and ten projects will be selected to receive seed funding for travel and accommodation. Janet Jones, Dean, School of Arts and Creative Industries at LSBU, said: “The spirit of hands-on collaboration and innovation runs deep at LSBU. We are delighted to find a similarly strong culture and energy at Ryerson, which is clearly expressed through Ryerson’s entrepreneurial ‘Zones’ and reflected in the ground-breaking research that FCAD and LSBU conduct within the creative industries.